The UniverCity community is comprised of four distinct neighborhoods: West Highlands, East Highlands, the Slopes and the High Street. Nestled among the trees, trails, and streams of Burnaby Mountain, West Highlands offers dramatic views of Burrard Inlet and the North Shore mountains, while offering the convenience of nearby University High Street shops and services, transit, and proximity to SFU Burnaby Mountain campus. The West Highlands neighbourhood features Highland House – the first project to achieve SFU’s Green Building bonus in recognition of enhanced sustainable features – and Altitude, UniverCity’s newest condominium residence. It is also home to the award winning UniverCity Childcare Centre and UniverCity Bike Park. Intergulf Development Group is currently developing The Peak and Terraces at The Peak along University Crescent. You can learn more by visiting Intergulf’s website, or the sales centre at UniverCity. Liberty Homes is developing Crescent Court consisting of two residential towers on University Crescent. More information about this project can be found on the Liberty Homes’ website. Mosaic Homes is developing Hamilton on University Crescent. This project will consist of a 96 unit high rise tower. You can learn more by visiting Mosaic’s website. 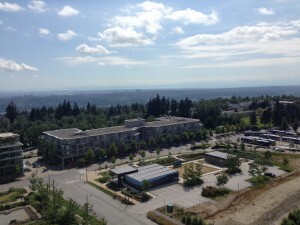 The first neighbourhood developed at UniverCity is located on the east side of Burnaby Mountain. Designed for beauty, accessibility and convenience, all residences are an easy walking distance to SFU, to transit and to the shops and services on University High Street. Winner of the Canadian Home Builders’ Association Grand Georgie Award for Best Multi-Family Development and National SAM award for Community Development. SFU Community Trust recognizes that a wide range of housing types are integral to establishing a diverse, equitable and lively community. To maintain housing affordability for SFU’s faculty and staff, Verdant has been designed in partnership with Vancity Enterprises Ltd. (VCE),to provide high-quality, energy-efficient market housing at below market prices. 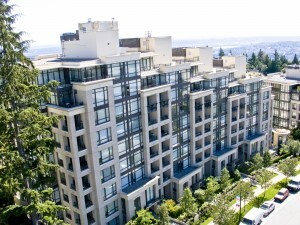 Fair market value of each suite at Verdant was individually assessed and offered at 20 percent below-market, with three conditions: first is that owners must reside in the suite (no rentals); the second is that on re-sale, the residence must be sold at the same percentage discount below then-current market prices; and third, is that the residence will first be offered to SFU faculty and staff with children before being offered to the general market. 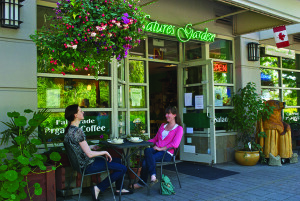 For more on Verdant, visitwww.verdantliving.com. Winner of Urban Development Institute Award for Innovations in Creating More Sustainable Development and Innovations in Creating a More Livable & Sustainable Region. 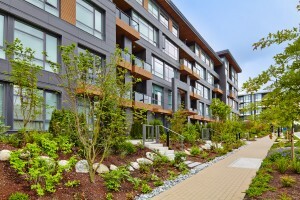 Verdant@UniverCity has also won the CMHC award for Best Practices in Affordable Housing. The East Highlands neighbourhood is home to University Highlands Elementary School, a LEED® Gold designed school that provides space for kindergarten to grade seven students. It is also home to Richard Bolton Park, the Community Garden and the Burnaby Mountain Conservation Area—one of the largest outdoor recreation areas in the Lower Mainland. Visit the Parks & Greenspaces and Childcare & Education sections of our website for more information. University High Street is a hub of activity, with a bustling public plaza and convenient access to shopping, restaurants, and services. 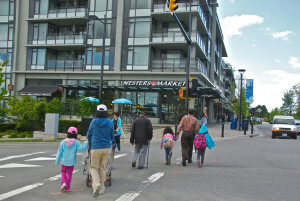 Linked by pedestrian pathways, this village-style block contains residences and over 25 local stores and services, everything from Nesters Market Grocery Store to Scotiabank, Subway, coffee shops, restaurants, a hair stylist, and more. Each building on High Street offers new services and amenities, providing the daily needs of residents, students, and visitors without having to step foot off Burnaby Mountain. 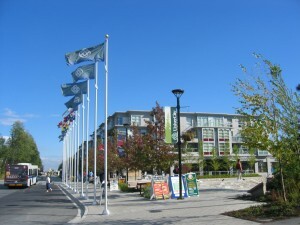 The High Street also features the Town Square – considered the heart of the community, the public plaza ties the campus to its residential community. Lined on one side with cafes and restaurants, the Square provides a venue for events, festivals, and concerts for students and residents. All buildings on University High Street are street-oriented, mixed-use buildings with residences situated above street-level commercial space. 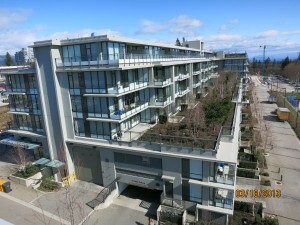 The Cornerstone Building is the first rental community on SFU’s campus offering retail and office space on the ground floor along with four floors of studio, one, and two bedroom rental apartments above. Sustainable building features include a green roof and a geothermal heating system. 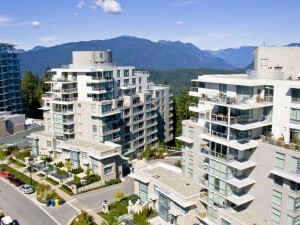 The Cornerstone Building received the 2005 City of Burnaby Environment Award for Planning and Development, Urban Development Institutes’s Award for Excellence in Urban Development, and BC Hydro Power Smart Excellence Award in the Residential Building Developer category. For more information about Cornerstone residential rentals, please contact Midwest Properties by email: cornerstone@rentmidwest.com or call 604-939-0221. For more information about retail leasing at Cornerstone, click here. The Cornerstone building is the home of SFU Community Trust, Terry Fox Foundation, Scotiabank and Subway. For a list of shops and services at UniverCity, click here. Built to LEED® Silver Standards, the Hub features energy efficient windows and a clean geo-thermal energy system to save energy. Other sustainability features include low-emission paint, efficient plumbing fixtures, and a green roof that regulates stormwater runoff. The Hub features a 24,000 square foot Nesters Grocery Store complete with Deli, Organic produce and UniverCity’s Postal Outlet. Spanning an entire block in the heart of the High Street district, the architecture is arranged in two primary structures to complement densities and uses while creating connections and view corridors between them. The apartment building to the south rises from a six-storey midrise in keeping with the High Street character to a slender 16-storey tower which marks the entrance to the commercial district. Along Highland Court to the north, the form is reduced to a row of 3-storey woodframe townhomes reflecting the residential nature of the street. The two buildings address each other across a wide internal courtyard which allows for public and private connectivity while providing privacy and greenspace for residents. You can learn more about CentreBlock by visiting Liberty Homes’ website, or the sale centre at UniverCity. The High Street corridor is the commercial heart of UniverCity. Extending from the bus loop and main campus on the west to the University Highlands Elementary School, it’s here you will find Nester’s Grocery Store, restaurants, coffee, shops, services, and more. For a complete list of merchants and services click here. The South Slopes neighbourhood is designed as a terraced hillside community, featuring low-rise, predominantly wood-frame homes for families. The slope and terraced design takes full advantage of views from southern Vancouver Island to Mount Baker in Washington State. 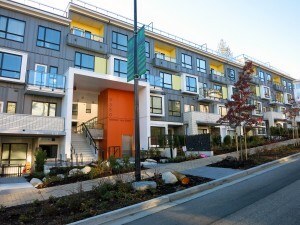 Origin is the winner of two 2013 Ovation Awards – Fortis BC Award for Excellence in Energy Efficiency in New Construction (Multi-Family Home) and Best Multi-Family Lowrise Development. Veritas by Polygon is a collection of one and two-bedroom modern apartment residences with a contemporary Westcoast architectural style. 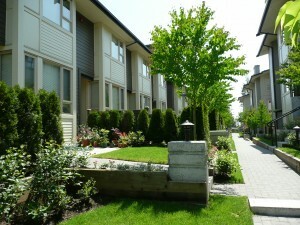 The Slopes is adjacent to many green spaces in our community. From the Slopes Neighbourhood Park (Parcel 32) just south of the Lift building to the hectares wide Burnaby Mountain Conservation area, the great outdoors is literally seconds away from most doorsteps. 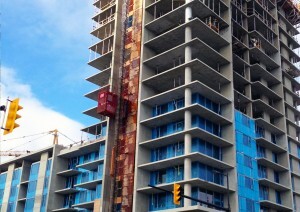 Mosaic is currently developing Fraser along University Crescent south. You can learn more by visiting Mosaic’s website. 8th Avenue Development is a new developer group to the UniverCity community and is currently developing Oslo on University Crescent (south). The project will include two mid-rise buildings. To learn more about Oslo, please visit Eighth Avenue’s website. *This is not an offering for sale. Such offering can only be made by the developer of the project(s) after filing a disclosure statement.